An analysis of clinical studies of amoxicillin was conducted to determine whether subjects aged 65 and over respond differently from younger subjects. 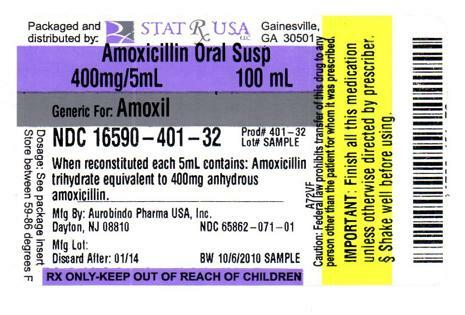 Of the 1,811 subjects treated with capsules of amoxicillin, 85% were less than 60 years old, 15% were ≥61 years old and 7% were ≥71 years old. This analysis and other reported clinical experience have not identified differences in responses between the elderly and younger patients, but a greater sensitivity of some older individuals cannot be ruled out. urethral infections probenecid as a single dose. +The children's dosage is intended for individuals whose weight is less that 40 kg or more should be dosed according to the adult recommendations. * This analysis was based on evaluable patients with confirmed duodenal ulcer (active or within 1 year) and H. pylori infection at baseline defined as at least 2 of 3 endoscopic tests from CLOtest®, (Delta West Ltd., Bently, Australia), histology, and/or culture. Patients were included in the analysis if they completed the study. Additionaly, if patients dropped out of the study due to an adverse event related to the study drug, they were included in the analysis as failures of therapy. + Patients were included in the analysis if they had documented H. pylori infection at baseline as defined above and had a confirmed duodenal ulcer (active or with 1 year). All dropouts were included as failures of therapy. ++ (p less than 0.05) versus lansoprazole/amoxicilin/ and lansoprazole/clarithromycin dual therapy. $ (p less than 0.05) versus clarithromycin/amoxicillin dual therapy. ++ (p less than 0.05) versus lansoprazole alone. $ (p less than 0.05) versus lansoprazole or amoxicillin alone.